Prime Minister John Key has raised the election-year stakes by attempting to deliver the coup de grace to NZ First after ruling it out of a National-led government. Mr Key took the unusual step yesterday of naming an election date nearly 10 months early and used the announcement as a platform to say there would be no coalition deal with NZ First. John Key HAS to kill Winston off. Immediately. Now. Not a second too late. He has to do this because of what NZ First's big 3 policies this election will be. National will be nervously eyeing Winston's strategy because his big 3 policies will be targeted to reap heavily from National's rump constituancy so by ruling NZ First out in the same breath as announcing the election date, Key hopes to circumvent any impact Winston generates when he announces his big 3 for 2011. 1: Dumping the repeal of section 59, making all the pro-smacking lobby excited. 2: Nationalizing the Foreshore and Seabed making the Coastal Coalition (some of whom believe Vikings settled NZ before Maori) ecstatic. ...those big 3 would be very concerning to National, they play to the National rump and could certainly see NZ First get over 5%. John Key has to cauterize that threat right from the get go, but it also forces National Party strategists to offer up some of their own raw meat policy to counter the populist nature of Winston's raw meat smogosboard, and that could spell trouble for benneficaries. The ideologically stacked Welfare Razor Gang comes out with their report this month. Key may have decided to outflank criticism that he's going to bennie bash by simply rejecting out of hand the more punitive garbage they'll come up with - (making Bill English look like a prat after he explained the $2billion deficit from his failed GST tax rise 'turbo charge' would come out of Welfare), but NZ First's populist raw meat big 3 will demand a policy response from National to try and blunt Winston's appeal beyond ruling him out at the get go. The joke in all of this is the media's constant reference to Key as a 'none politician' politician, when nothing could be further from the truth. Each Chess move is made to maximize Key's smile and wave political capital, it's not 'shoot-from-the-hip-in- the-gut-instinct-heat-of-the-momen-decider politics, it's well crafted and seamless. Key flags late election over the holidays and states he'll quit if he loses and then rules NZ First out right after fulfilling his credibility by declaring the election 10 months before he has to. If anything NZ First's big 3 policies will be a nightmare for Labour, they can't side with Winston on any of that and the Maori Party and the Greens won't tolerate it meaning the need for extra allies in the form of a New Left Party increasingly more vital if the left have any hope of turning the MMP math. It will be a fascinating election. I've had it suggested that "Death Penalty" will be one. Even though he has no chance of having it adopted. I don't have anything to add other than to say "well done", Bomber, on writing the first reasonably well-balanced post that I've read (give or a take a few minor digs). LMAO Winston will always keep them honest if he gets back in. The Wine Box enquiry is a good example of public money been used to make the rich richer and the poor poorer as the truth came out. Oh that's right if we ignore the truth it will all go away. 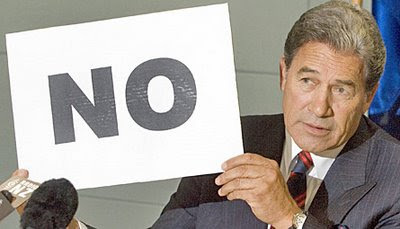 Winston Peters soaks up some of the semi-lost elements in the right wing electorate, those who know (but don't like to admit) Key's National are doing them no good, but won't vote Labour on principle and are scared of ACT. So Winston pushes some of their favourite buttons (immigration, crime, pension issues) but isn't a 'bloody lefty.' Actually Peters isn't anything but an opportunist and tub thumper. NZ First will hurt National - not their ideologue supporters but their lower middle class and upper working class pragmatists.